Product prices and availability are accurate as of 2019-04-18 17:27:23 UTC and are subject to change. Any price and availability information displayed on http://www.amazon.com/ at the time of purchase will apply to the purchase of this product. 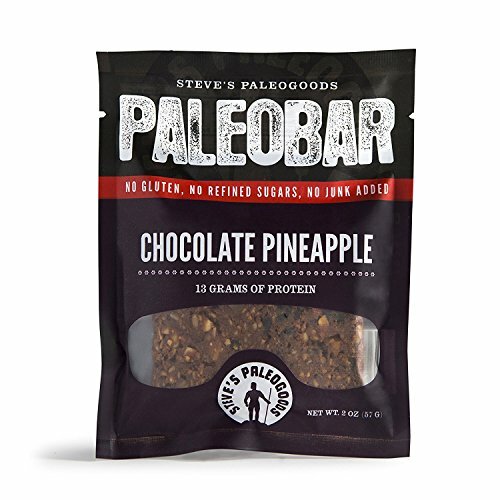 The Chocolate Pineapple PaleoBar is oh so clean and delicious. Gluten-free and grainless, it packs a whopping 13 grams of protein and tastes homemade, with no added preservatives, artificial sweeteners or refined sugar. Made with REAL egg whites, our PaleoBars are a great way to start the day with a cup of coffee or the perfect protein-packed snack for your backpack! 1.5 oz bars Combines the delicious taste of some of your favorite PaleoKrunch ingredients; Almonds, shredded coconut, dried pineapple, cocoa, and a touch of honey, lovingly blended together with REAL egg whites Gluten-free and grainless, it packs a whopping 13 grams of protein and tastes homemade, with no added preservatives, artificial sweeteners or refined sugar Our PaleoBars are a great way to start the day with a cup of coffee or the perfect protein-packed snack for your backpack! Steve's PaleoGoods is a small family owned and operated business since 2008. Our products are made by hand in small batches, using the best ingredients, as close to nature as possible.